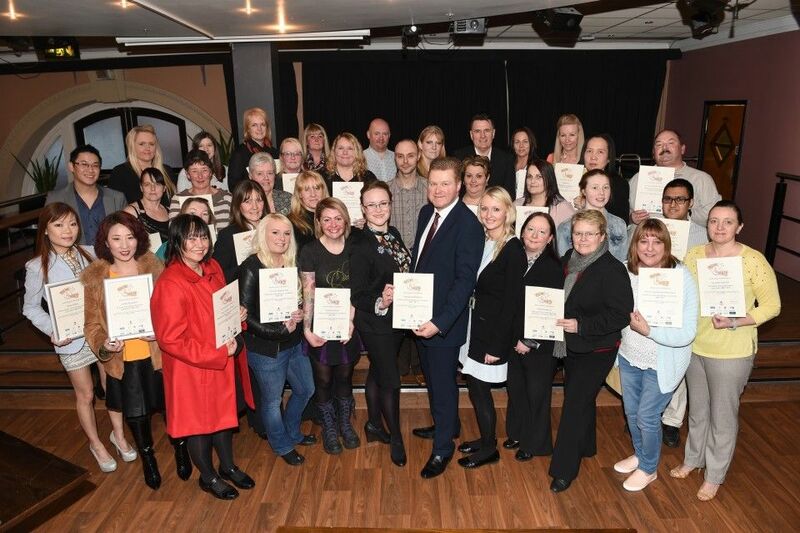 The latest ceremony to welcome an amazing 45 new establishments to the campaign was held at Blakey’s Cafe Bar in Blackburn. Recipe 4 Health is Blackburn with Darwen Council’s Environmental Health team working in partnership with Public Health. They are working with food businesses to try and improve the amount of healthier choices on the menu. The award has been given to establishments from all areas, involved with the food industry, including takeaways, charities, community centres, shops, hotels, schools, nurseries, residential homes, bakeries and sports clubs. These include Royal Blackburn Hospital, Blackburn Youth Zone and Blackburn Rovers Blues Bar and Brew Room, as Recipe 4 Health is working with the club to trial a fresh healthier option within the concourse catering. Blackburn with Darwen Council Officers are working with businesses to help and advise about healthy options, offering free menu analysis and advice on allergies labelling, whilst helping them to add healthier dishes to their menus, reducing harmful fat content, salt and sugars. The award is free to businesses and available on three levels – Bronze, Silver and Gold – linked to the Government’s Food Hygiene Rating Scheme, The aim is not to force people to eat healthier options, but to make it easier to find healthy options when eating out for those who want them. “The Recipe 4 Health campaign is a brilliant way to promote healthy eating and smart food choices all across the borough, and it is fantastic that so many establishments across the board are signing up to it. The newest members of the project are: Billy Bunters Sandwich shop, Green Chilli Deli, Purpletons Butty Bar, Oak Tree Nursery, Frankie’s Big Baps, Tower Sandwich Shop, Upper Crust, Blackburn Youth Zone, Jo Little’s Sandwich Shop, Royal Blackburn Hospital, Burnley Road Fish and Chips, Holy Trinity Primary School, Feniscowles Infant School, Sandwiches To Go, Macs Snack Shack, Old Vicarage Nursery, Rae’s Wholefoods, Lammack Primary School, Meadowhead Junior School, Slater’s Quarters and Muffins Café. Also: The Eatin’ Place and Takeaway, Astley Bank Care Home, Oriental Star, Blackburn Rovers Blues Bar, Blackburn Rovers Brew Room, Ocean Palace, Alexander’s Delicatessen, Tasty Bits, The Whitehall Hotel, Railway Hotel, Fareed’s Takeaway, School House Nursery, Tuck Inn Café, Oliver’s Caffee House and Café, Mega Munch, Marjory’s Catering, Nightsafe, Wild Flour Bakery, Bread Box, Tunstill’s Bakery, O’ Marley’s Red Lion, Bubba’s Butty Bar and St Silas Primary School.